52 MMS March 2017 mmsonline.com SHOP TALK and using real-time data to connect machines. Together with Walter, the company also develops software solutions for connecting all devices in the production environment, from machines and tools to logistics and databases. Walter says synergies made possible by the joint venture will enable digitizing and connecting tools with greater precision and sophistication and optimizing them using real-time data. 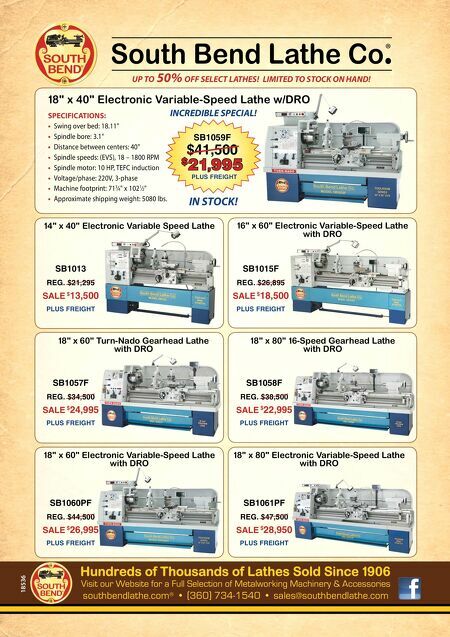 Walter USA LLC, call 800-945-5554 or visit walter-tools.com/us. 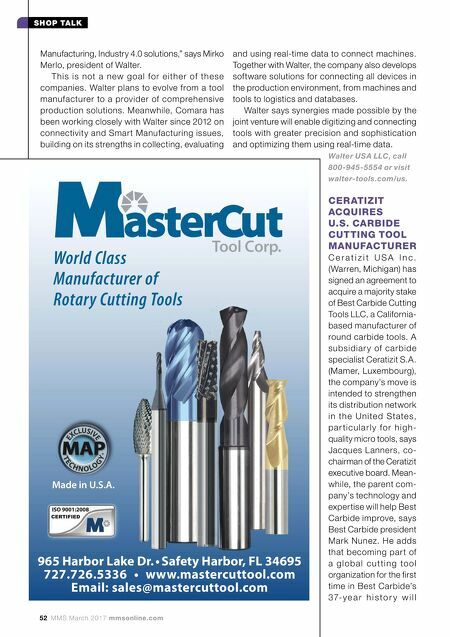 CERATIZIT ACQUIRES U.S. CARBIDE CUTTING TOOL MANUFACTURER C e r a t i z i t U S A I n c . (Warren, Michigan) has signed an agreement to acquire a majority stake of Best Carbide Cutting Tools LLC, a California- based manufacturer of round carbide tools. A subsidiar y of carbide specialist Ceratizit S.A. (Mamer, Luxembourg), the company's move is intended to strengthen its distribution network i n th e U n i te d S t ate s, p a r ti c u l a r l y fo r h i g h - quality micro tools, says Jacques Lanners, co- chairman of the Ceratizit executive board. Mean- while, the parent com- pany's technology and expertise will help Best Carbide improve, says Best Carbide president Mark Nunez. He adds that becoming par t of a g l o b a l c u t t i n g to o l organization for the first time in Best Carbide's 3 7- y e a r h i s t o r y w i l l Manufacturing, Industry 4.0 solutions," says Mirko Merlo, president of Walter. T his is not a new goa l for e ithe r of the se companies. Walter plans to evolve from a tool manufacturer to a provider of comprehensive production solutions. Meanwhile, Comara has been working closely with Walter since 2012 on connectivity and Smart Manufacturing issues, building on its strengths in collecting, evaluating World Class Manufacturer of Rotary Cutting Tools 965 Harbor Lake Dr. • Safety Harbor, FL 34695 727.726.5336 • www.mastercuttool.com Email: sales@mastercuttool.com Made in U.S.A.